Children With Starving Brains is a message of hope in the midst of a worldwide epidemic of autism, ADD and ADHD. 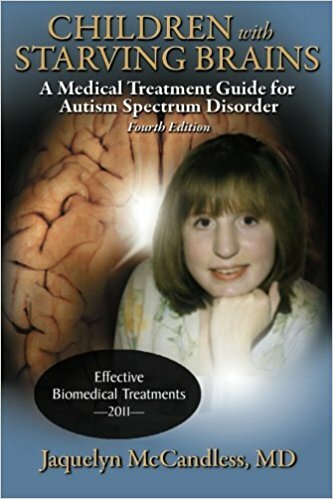 This is the first book written by an experienced clinician that gives a step-by-step treatment guide for parents and doctors based on the understanding that ASD is a complex biomedical illness resulting in significant brain malnutrition. Genetic susceptibility activated by “triggers” such as pesticides and heavy metals in vaccines can lead to immune system impairment, gut dysfunction, and pathogen invasion such as yeast and viruses in many children. Dr. McCandless, whose grandchild with autism has inspired her “broad spectrum approach,” describes important diagnostic tools needed to select appropriate treatment programs. Her book explains major therapies newly available and identifies safe and effective options for parents and physicians working together to improve the health of these special children.